CLICK IMAGE to volunteer at our 2019 Planting Independence Event! Hundreds of volunteers help clean up yards in Spring 2019 Won't you or your group help us at this community-wide event in 2020? 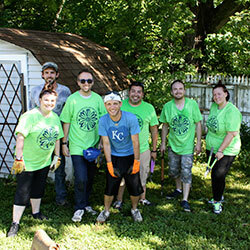 Yard maintenance can be a tough situation for people with disabilities. This activity with our volunteers helps TWP Consumers get a handle on their yards and avoid unnecessary fines from the city where they live. This is an excellent volunteer opportunity for individuals, families, clubs, schools, scouts, organizations, and businesses who are looking for an activity to give back, be outdoors, and serve individuals in our community that live with disabilities. The next Planting Independence Event will be held in Spring 2020. Seeking Volunteers to Plant Independence! We are always seeking volunteer groups and individuals to help with the Planting Independence Program. 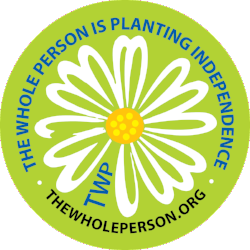 Please contact Kelly Grooms at 816-627-2232 (or email to kgrooms@thewholeperson.org) if you would like to provide support with our “Planting Independence” initiative. If you are an individual we will add you to an existing group. One person from each group will be required to attend an "Information Session" at The Whole Person to receive details about their assignment and to get supplies to assist with the work.